GlassPoint Solar, the leader in solar enhanced oil recovery (EOR), is establishing a new office in Kuwait City and has appointed Abdul Hussain Shehab as country chairman. With more than 40 years of experience in Kuwait’s upstream oil and gas industry, Shehab will lead the company’s expansion in the state. Shehab was previously managing director and CEO of Al Dorra Petroleum Services Company and prior to that served as the deputy managing director of Kuwait Oil Company (KOC) overseeing the West Kuwait Fields. Shehab was with KOC for more than 30 years, holding various management positions across reservoir development, drilling and production operations. Under his leadership, KOC initiated the first steam flood project to produce heavy oil at the Wafra Field in the Neutral Zone, which is shared with Saudi Arabia. 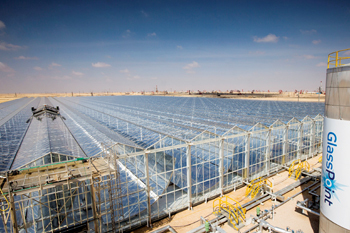 “GlassPoint offers the only solar steam technology with proven oilfield performance, withstanding high levels of dust and sandstorms common in the Gulf. I am proud to join GlassPoint in this rapidly growing venture and to bring this innovative thermal recovery solution to Kuwait,” he added. Thermal enhanced oil recovery, or steam injection, is the leading method of producing heavy oil. In thermal EOR, high-pressure steam is injected into the reservoir making the oil easier to pump to the surface, boosting well productivity by up to 300 per cent. Planned thermal EOR projects in North Kuwait and the Neutral Zone will require burning significant amounts of costly fuel oil or imported natural gas to generate steam. Using the sun’s energy to produce steam could supply the majority of Kuwait’s thermal EOR needs, freeing valuable gas and fuel resources for higher value uses. Emissions-free solar steam will also improve local air quality. Shehab is an active member of the Society of Petroleum Engineers (SPE), and served on the Board of Directors for three years representing the Middle East region. He currently sits on the boards of Gosco and Stone Energy, and was previously a board member of KOC, Kuwait Gulf Oil Company (KGOC) and Burgan Drilling Company. GlassPoint’s expansion follows a successful milestone in Oman, where its project with Petroleum Development Oman (PDO) recently surpassed one year of operations, exceeding steam production targets. The 7 MWt system deploys GlassPoint’s enclosed trough technology, which seals large parabolic mirrors inside a glasshouse. The structure protects the solar collectors from sand and dust and is equipped with a proven, automated washing unit to maintain performance in harsh desert environments.